Long gone are the days when you need a filing cabinet and a great secretary to store your paper files. The days have even passed when you need to send files by emails as attachments and have them lost in the mile-long thread of irrelevant conversation. There are now easy online file sharing options that can help your team work effectively and there are ways of using this to ensure it remains an efficient shared tool. It may be that you are yet to sign up to a file sharing site. It might be that you have made the decision to move this way but do not know which is the best and most secure service to use. It might be that you have been file sharing for a while now but your site is an absolute mess and no one can find anything – it could be that your online sharing is making your life harder. Why is online file sharing going to make your team more effective? What online file sharing tool is the best for you and why? How can you efficiently organise your file sharing so that it continues to help you work effectively as a team? Why Is Online Sharing Going To Make Your Team More Effective? There are four reasons you might want to file share online. First, the files are too large to send via email and therefore sending a link via an email is your only option. Two, you share files so often that email is an inefficient means of sending files, as you are continually having to monitor version control and then having to seek the right file from the right email. Three, you may want to collaborate on the file, either in real-time or over the course of many weeks and it would be easier to do this online. Finally, the potential for loss of data due to hardware failure makes cloud storage an essential back-up anyway. These are four incredibly good reasons for file sharing and show how your team could become more effective from the get go. However, file sharing online makes data vulnerable and many IT administrators worry about the practice with sensitive corporate data. So, it is not a case that you should blindly go into file sharing with any old site. It is still something to move towards with a degree of caution. You will need to do some work on security – particularly who has permission to view files. But more on this later. It is fair to say that this is a problem that is worth navigating for all the benefits you are going to receive from a good file sharing system. There are many platforms that offer file sharing as an option. Your starting point for deciding which one to choose is considering what you want from your file sharing platform. Do you want to collaborate on files? Do you want an effective storage area? Do you need a lot of space? Do you want it to be part of other team management tools? Do you want to pay for the storage? Do you need the cloud to be additionally secure? Once you have decided the answer to these questions, the best tool will reveal itself in the functions offered by each platform. 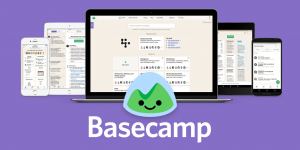 Basecamp is one of the best project management tools on the market. It is more than just file sharing – there is also task allocation functionality, calendars, chat and messaging. However, the file sharing is excellent in Basecamp because it automatically organises the files into the teams that need to see the file – because that is the camp within which you are sharing the file. There are also options for commenting on this file and tracking the changes made within the platform. This means all the issues of version control disappear. Google Docs are productivity software, where you can produce documents, spreadsheets and presentations. However, there is the option of working on these with others in real-time. You can set documents to edit together, receive suggestions or receive comments. All of this is available wherever there is an internet connection, making it a hugely convenient collaboration tool. Google Drive is a file storage area and you get a lot of storage for free. There are clear ways of sharing the file and clear permissions that can be set – including ownership. Dropbox is a similar facility as Google Drive but doesn’t offer quite as much free storage as Google. However, Dropbox functionality is much simpler and more likely to be used effectively by your team. The Dropbox folder acts like any other folder on your computer and everything put in there is uploaded to your online area. There are also advanced settings that allow you to select which files are synced and to see what has recently changed – so you can see what colleagues have added to the drive too. It does not require you to remember to use it – like maybe Google Drive does – it feels as intuitive as saving a file normally. It may be that you just want an easy file share option. You might not need the online storage or the collaboration. You just need a quick and easy way to send a large file that doesn’t require downloading any software or signing up to a service. If this is the case then YouSendIt might be perfect for this single function option. The service allows you to send up to 250MB files to someone – which is the equivalent of what most emails will allow you to send full stop. How Can You Efficiently Organise Your File Sharing So Your Team Benefits From It? So, having chosen your platform and started working collaboratively or sharing files online, you now need to put practices in place that will help you to continue to work effectively. Keep the permissions you set as simple as possible. If some files are for information only, then set up for comments only or for read only. If you are collaborating on a document then open it for suggestions – if the team are not going to be responsible for actioning the final file. If there are issues with people potentially misusing or deleting important information from the file share, then treat this as a training issue rather than a software issue. Set up procedures for use of the share drive that are clear and allow for effective and transparent use by all. Keep the filing system in the area logical and intuitive. When designing folders and subfolder structures you need to think of the person you will be onboarding in the future who has no idea about the company. It needs to be obvious from looking at the structure where information might be found and where files should be stored. You might find the name of a file funny it that moment of saving – but if no one else can intuitively work out what is in the file it may be of little use to your company. This sounds painful… or some weird science fiction time space continuum issue. In reality, it is when everyone has the right to create folders and then folders within folders and then maybe even a folder within a folder within a folder. Suddenly, your file structure looks something like the map of the London Underground but without the helpful colour coding! Therefore, the folder structure should be defined by one person and people given specific areas within which they can store personal files that are not clearly applicable to the areas set out. What you want to avoid is a vertical folder structure that will send the file path beyond 255 characters. After 255 characters then Windows will not show up the root to getting to the file on the screen or on the inserted root at the bottom of documents. In short, keep folder structures simple! If your team are working within a certain area of the shared drive often then they should really have a shortcut to this area on their desktop. This is such a simple strategy but one that can literally save hours in frustration at finding the areas they need to access. There are no limits on the shortcuts they can create to shared folders but it is only a time saving device if these are clickable easily and without having to scan through lots of icons. Once you have set up permissions and the rules for creating a folder structure, etc. you then must maintain these good practices. If the file sharing area becomes untidy and misused then it will stop making your team effective and instead make it inefficient. As you can see by following a few simple steps you can easily organise your file sharing effectively. It is definitely going to pay off in the future, because you simply stop wasting unnecessary time with organising tasks that you could have done in the beginning. Read more on the best management systems for your business.